In Violent Cases, an adult narrator evokes a confused patchwork of childhood memories, from his uneasy relationship with his father to the half-comprehended gangster stories of an osteopath who claims to have treated Al Capone. 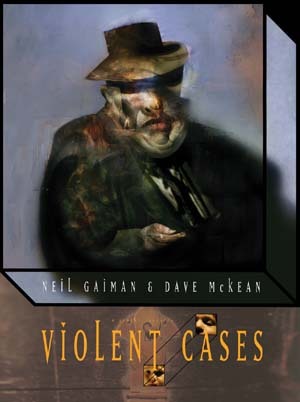 Neil Gaiman and Dave McKean’s first collaboration? Too cool! McKean’s art can be hit-or-miss for me, but here, I loved it. It has a scratchy, sketchy, flickering quality, like a very old slide show being flicked by, or an old film, and the black inkwork is just barely shaded with beautiful shades of sepia and ghostly blue. Add in the splintering, tilting panels and the narrator’s suggestively spare commentary, and you have an incredibly evocative, ominous story about the insidiousness of violence – physical violence, imagined violence, the violence we do to ourselves in letting ourselves forget the ways in which we were hurt and damaged – and the ways that memories reach out to one another inside of our heads, and make strange but right connections. 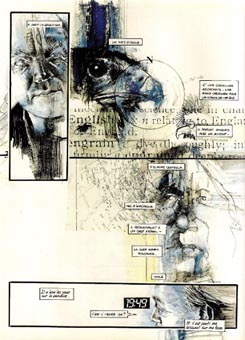 The last page of the book (not the one above) features a wordless, panel-by-panel spread of all the little moments of the narrator’s memories, each image – a breaking bone, a car’s tire splashing through a puddle – transforming into another, so that they form an endless chain. It was so beautiful that I had to go back and “read” it several times. Violent Cases is a masterpiece of subtlety and suggestion, and a reminder that graphic novels are actually an art form, not just pictures with words slapped over them (or vice versa). It’s visual poetry, imbuing commonplace images with huge emotional force over the course of a work through repetition, connotation, and association. And of course, this is what makes up our memories, too – chains of images that would have no meaning outside of the context of our own minds and experiences.